Next year county: Viva Mexico! More highlights from Against the Current, mainly on the Mexican revolution, below the fold. Jim Denham versus Foyle’s War. Killing and dying for “the old lie” – World War and the triumph of militarism over anti-fascism. Spain is nice at this time of year – the BNP and Spanish fascism. Beijing Coma – can the symbols of classic socialism still be symbols of emancipation, despite their blood stains? Oscar Wilde on socialist songs – Up, ye People! or down into your graves! The partisan poet – Adam Kirsch on Abba Kovner. Ethel MacDonald and Bob Smillie – and Guy Aldred and Fenner Brockway. More Guy Aldred. Carlo Tresca – The Dilemma of an Anti-Communist Radical. The sweet and the cruel – Ian Buruma on Occupied Paris. The Labour Party between the wars – ideological contours. 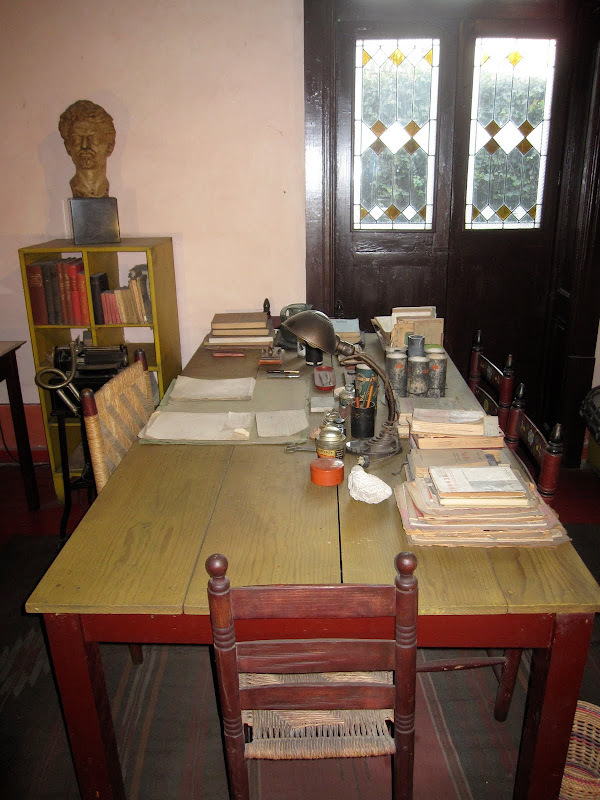 A postcard from Coyoacan – Trotsky’s last home in Mexico. Translated novels – including Victor Serge’s Unforgiving Years. Stalin’s Terror – a review by Peter Taafe. David North on Robert Service on Leon Trotksy (and on James Burnham on Isaac Duetscher on Leon Trotsky) – not sure if I’ve already posted this one. Open letter to Havana – on Stalinist slurs against the Freedom Socialist Party. The Black Marxist Tradition – an interview with Cedric J Robinson. The Search for the Tassili Frescoes – Afrocentrist history and CLR James at Federal College. The John Hope Franklin File – the FBI, anti-communism and black history. Stalin: Why and How – Boris Souvarine. The myth of Mondragon – Louis Proyect debunks Spanish autogestion? Poplarism – a review of Janine Booth’s book. Half a century of Hausman’s – from the North East London radicals, from Permanent Revolution. A Rebel’s dream – Ian Birchall on Ernest Mandel. George Padmore – forgotten fighter. Reasoning otherwise – Canadian radicalism 1890-1920. More years of the locust – Permanent Revolution on Jim Higgins on the origins of the IS. Decline – Scott McLemee on Cornel West. Plus more from Michael Tomasky. New from AK: Italian anarchism 1864-92, French anarchism 1917-45, Zapatismo and the Panthers. Flag Day in Lawrence, MA, 1912 – a slice of IWW history. Fascism has opened up the depths of society for politics. Today, not only in peasant homes but also in city skyscrapers, there lives alongside of the twentieth century the tenth or the thirteenth. A hundred million people use electricity and still believe in the magic power of signs and exorcisms. The Pope of Rome broadcasts over the radio about the miraculous transformation of water into wine. Movie stars go to mediums. Aviators who pilot miraculous mechanisms created by man’s genius wear amulets on their sweaters. What inexhaustible reserves they possess of darkness, ignorance, and savagery! Despair has raised them to their feet fascism has given them a banner. Everything that should have been eliminated from the national organism in the form of cultural excrement in the course of the normal development of society has now come gushing out from the throat; capitalist society is puking up the undigested barbarism. Such is the physiology of National Socialism. Tendance Coatesy: Review of Under Two Dictators by Margarete Buber-Neumann.